National Egg & Poultry Awards 2019 now open for entries! There was a hugely popular winner of the Chris Brant Award at the National Pig Awards as Rita Wells was honoured for her ‘sustained and unsung’ work with pigs and with Ladies in Pigs (LIPs). Rita has worked for JC Lister Farms, in Yorkshire, for many years and has put a huge a amount of time and effort into supporting the fantastic work of LIPs as they promote Red Tractor pork up and down the country. 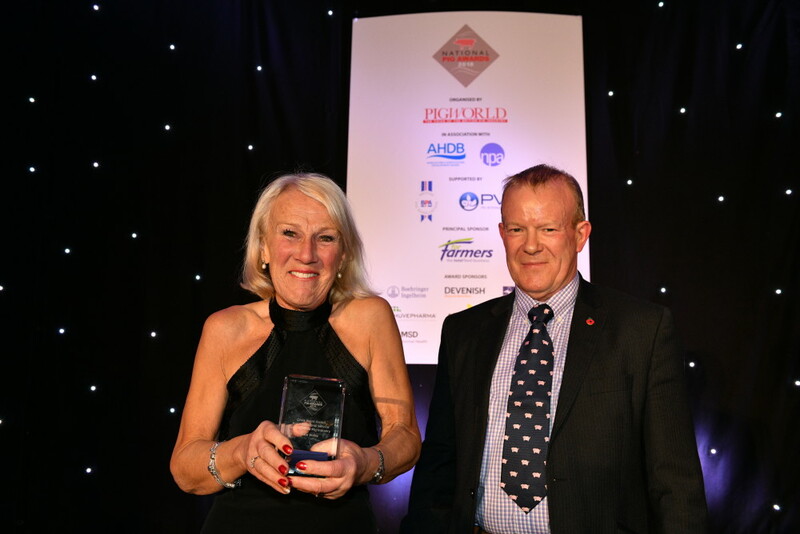 An emotional Rita received the award to a heartfelt standing ovation after her name was read out by Richard Longthorp, presenting the award that every year recognses the pig industry’s ‘extra milers’, those that go above and beyond in their support for the industry. In his citation, Richard described Rita as one of the industry’s ‘unsung’ heroes. “This year’s Chris Brant Award winner works both in the industry and works for the industry and certainly matches those critical criteria and phrases the judges use in their deliberations such as ‘Extra Mile’ and ‘Sustained Service’,” he said. “But the characteristic that clinched it for this year’s winner in the minds of the judges was ‘Unsung’. “Simply getting on with the day job as a highly skilled stockperson but then putting in as much effort, enthusiasm and dedication on days off from work promoting the industry. “Hailing from God’s Own County of Yorkshire, it may be that not many folk outside of Yorkshire will necessarily have heard of the winner. But those of you fortunate enough to be blessed with coming from the Promised Land that gave you the likes of Boycott, Truman and Tetleys will, I am sure, be aware of all the work that this year’s winner puts in and has put in for the past 20 years or so. “For the rest of you, well, tonight is the night when you and the whole British pig industry will have heard of her. And be able to show its heartfelt and enthusiastic appreciation for her years of unstinting work and support for our industry. Rita said the award as totally unexpected but described as a huge honour for her and the many like her that dedicate so much time for the greater good of the industry.